Many people are suffering from hunger, but on the other hand, a lot of people buy more than they can eat and consequently they cannot finish their meals. In 2016, Japan made about 632 tons of food loss. Surprisingly it is twice as much food as the world’s assistance of food. Therefore, we will be able to resolve food loss in the world by decreasing the food loss in Japan. Where does the food loss in Japan come from? Look at Figure1. According to Figure1, about half of the food loss comes from home, and the other half occurs in the course of selling food. Food loss from home is divided into three categories: cooking scraps, left-over food and food which are thrown away without being cooked. According to a research of Japanese Ministry of Agriculture, Forestry and Fisheries in 2013, 56% of kitchen garbage from home is cooking scraps, 17% is left-over food and 22% is unused food. This 22% is particularly remarkable. About 1/4 of unused food doesn’t pass the expiration date though we don’t need to throw away food before their expiration date . 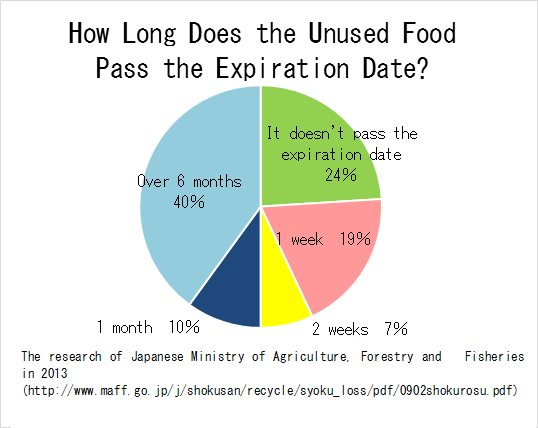 And more than 2/3 of unused food passes the expiration date over six months. It shows that many people aren’t careful of the stored food. Food loss from industry occurs in food manufacturing, food wholesaler, food retailing and food service industry. occurring in the course of selling food, it is necessary to recycle garbage and prevent too much production by sharing information of the output among different kinds of industries. According to the report in 2011 of FAO (Food and Agriculture Organization), 1.3 billion tons of food loss were produced all over the world in one year. This amount corresponds to 1/3 of world’s food production in a year. Figure3 demonstrates that there are big differences in the stage of consumption. 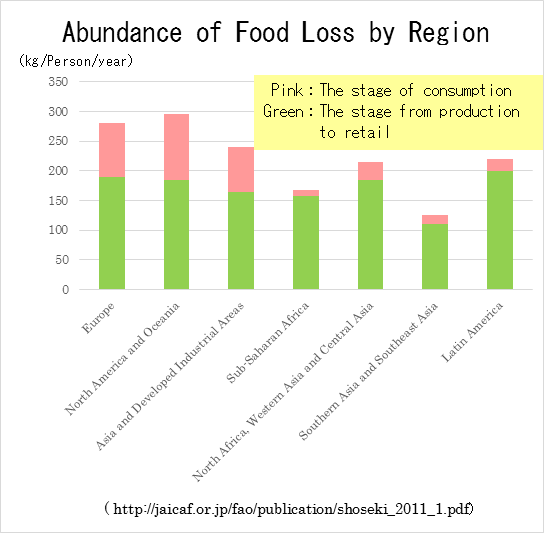 As you can see, developing areas tend to make much food loss in the stage of consumption, however on the other hand; developing areas sometimes make food loss because of underdeveloped market and circulation. What do people think about food loss? In October 2016, we sent a questionnaire to 220 students in our school. Q. 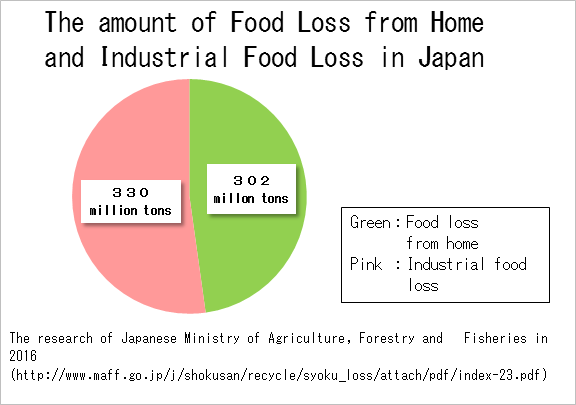 Have you known about food loss problem in Japan? Let’s compare the public recognition about food loss with the one among the students in our school. 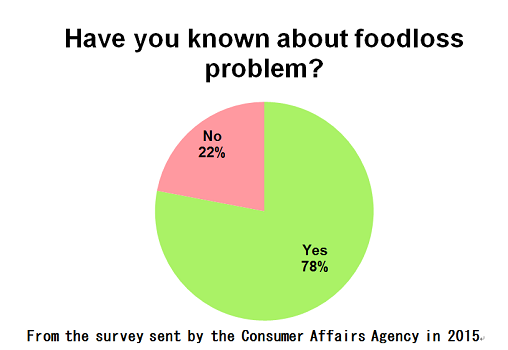 According to the survey by the Consumer Affairs Agency (CAA), 78% of people recognize food loss problem (Figure 1), which is higher than we expected. In our school, 95% of the students answered, “Yes” (Figure 2). In our high school, the first-year students learn about food loss in home economics and geography classes in the second semester. It seems these classes contribute to the high recognition among the students. 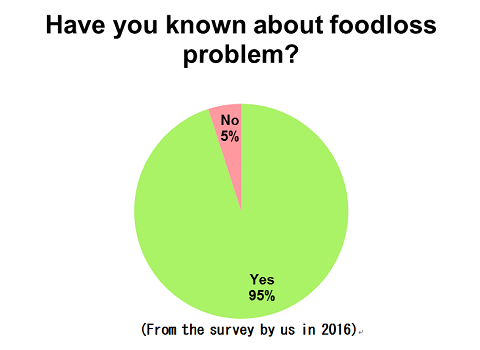 The survey demonstrates that many people knew about food loss, and then we asked the students what they actually do to reduce food waste. Q. What do you do to reduce food loss? According this questionnaire, more than 98% of the students are trying something to reduce food loss.